Having never experienced open air cinema before, I was super excited as I walked into the magnificent grounds of Wales’ largest castle. I was also full of important questions: Would it be loud enough? Would the picture be clear? Would they sell wine? And, would Hugh Jackman actually be able to sing? As I walked in with my haul of three blankets, two coats, two sleeping bags and four jumpers, I was (as always) delighted with the gorgeous backdrop of my surroundings. I really couldn’t believe how lucky I was. I was also pleasantly surprised to see that there was a bar (woo hoo!) and, unlike many cinemas, the prices were reasonable (£10 for a bottle of wine, £1 for pop/sweets/popcorn and pizzas started at only £5.50). A great start indeed. Then, it was time for the film to begin and my daughter literally yelped with excitement. Like many others, she sang quietly to the opening number and I was really surprised by just how fantastic the sound quality was. Despite being outside, the acoustics were perfect. I could hear everyone singing along but this didn’t detract from the film at all. In fact it just added to the fun filled atmosphere. 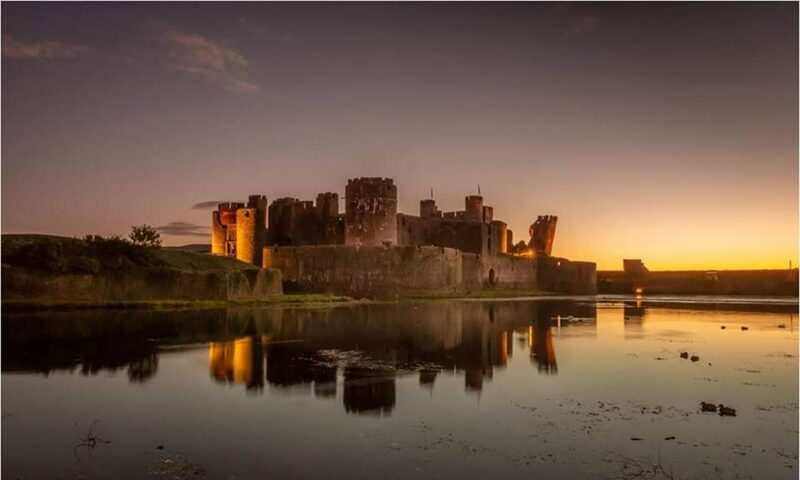 The timing of the start of the film meant that the picture quality was also of a very high standard and, as the evening grew darker, the beautiful backdrop of Caerphilly Castle became increasingly more majestic. My daughter kept looking around in amazement and I was also a little speechless; the glow of the beautiful, historical surroundings at night time and the stars shining down on us. It all just felt magical (as my daughter put it). I also have to say a big thank you to the crowd. The relaxed vibe really added to the atmosphere. Everyone was friendly and courteous, plus the singing and crowd laughter was lovely. I can see why so many have ‘going to an outdoor cinema’ on their bucket list. This is definitely my new favourite way to see a film! – If you’ve only got blankets (like us), get there for when the doors open so that you can get a nice spot in front of the chairs. – Take some blankets and cushions to sit on. The ground in Caerphilly Castle was perfect to sit on but if you’re at a venue with a harder surface, this would be a must. – Take some things to cwtch up with. Last night, it was fairly warm so my sleeping bags weren’t really necessary but they did help to make everything extra comfy. My daughter and her best friend loved cuddling up in their sleeping bags before the film started and as the night grew a little colder, I loved getting warm hugs with my little one. So, would I go again? Yes definitely and hope that more of these events happen here.